Children joining their families at the upcoming Bapco Bahrain GT Festival will be able to enjoy a wide array of fun-filled entertainment and activities. Bahrain International Circuit (BIC) has put together an exciting programme for kids so that they may fully enjoy their experience come November 30 and December 1 at “The Home of Motorsport in the Middle East”. At the Bapco Bahrain GT Festival, there will be a wide array of acts that will be keeping the youngsters engaged at the circuit’s vending area. Among them are The TNT Show, Maple Staplegun, Pop The Balloon Man and the Tutti Fruttie Rainbow Ladies. Full of silliness and awesome juggling, The TNT Show is a lovable, self-proclaimed professional entertainer who will be delighting not only the kids but race-goers of all ages. This high-energy show daringly mixes circus, clown and physical comedy. Meanwhile, armed with hula hoops, office items and a quirky attitude, Maple Staplegun is set to show the audience that not all is what it seems. Amazing hula-hoop manipulations mixed with absurd improvisations and physical comedy, her audiences will be amazed while at the same time unable to contain their laughter. Pop The Balloon Man will also be a crowd favourite, being now a veteran of BIC events. 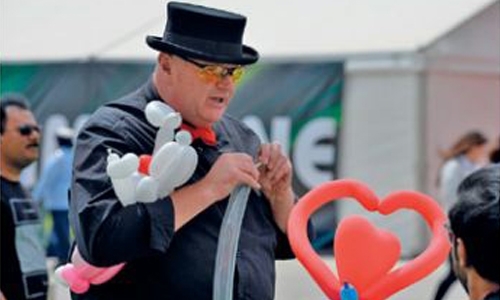 This multi-award winning magician and balloon artist from Scotland will showcase his incredible skills with a couple of balloons and a balloon pump. He never fails to amaze, and he will surely give joy to everyone while giving them something to take home as well. Also putting smiles on people’s faces will be the Tutti Fruttie Rainbow Ladies, who are the tallest, most elegant ladies in town! The Tutti Fruttie twins will dazzle the BIC crowd with their rainbow outfits and sunny personalities.